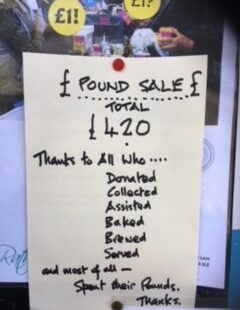 The 14th April 2018 was another very successful and enjoyable Pound Day, which raised £420 for the Reading Room. Thank you to all who donated items, to those who baked and brewed, to those manned the stalls on the day, and especially to everyone who came along and ate the delicious cakes and then carted off armfuls of un-put-downable bargains (or even things of which they were heard to say, as they lugged them towards the door, “don’t ask me what I’m going to do with this… but for £1…”). We look forward to seeing all of you (and probably many of the items) again next year!